Anyone else noticing how dark it's getting? Fall is definitely here, and Winter is on it's way! As much as I love the dark evenings for a new host of shooting opportunities, one of the things I picked up last year that I had been hankering after for ages was a Canon Speedlite to help with my indoor pictures over the dark winter months. I thought it might be helpful for some of you to understand why you might need or want to use an external flash on some occasions, especially now that the day light hours are getting shorter! Most entry or mid level cameras come with a built in flash, that pops up when you need extra light. You will hear time and time again not to use that pop up flash, as it flashes light onto your subject in a unflattering way. (Higher end cameras like my Canon 5d MkIII don't even have a pop up flash) All / most cameras have the ability to take a speedlight - that little metal bracket at the top of your camera is called a hot shoe mount and this is where a speedlight slots in. If you have one of those, you can use an external flash. The difference between an external flash like the Speedlite above, and your camera's pop up flash, is the ability to control the quantity and direction of the light. So, the 430EX (shown near the bottom of this post) is able to swivel the head 180 degrees front to back, and side to side, allowing you to bounce your flash in a range of directions, rather than straight at your subject! 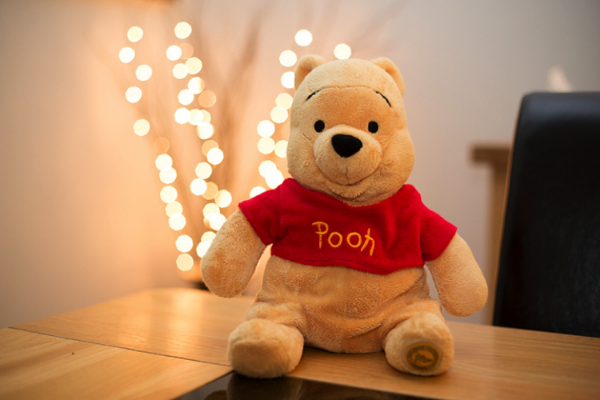 Some examples for you now, this time using my good friend Winnie the Pooh (we had the Dave the minion a couple of weeks, it's like Toysrus on the blog) . These photos were taken in my dining room, at night, when it is totally dark outside, and the room is lit by just a couple of low watt lamps. In this first photo, the picture is totally lit by the light from the lamps. It doesn't look too bad sized for web, but I have had to use a whopping ISO12800 to get this picture. This is extremely high (and if I remember correctly, the highest ISO level that my old Rebel could do pushed to its absolute limit) and therefore extremely grainy and noisy. I could have lowered my shutter speed, especially since my subject is sitting still, but most of the time I'm photographing people, so I need my shutter speed to be around 1/125 or I'll get motion blur, so that's what I've used here. This next shot is what happens if I point my flash straight onto my subject, much the same way as using a pop up flash on your camera would. It's not TOO bad, I guess, but you can see that the whole mood of the photo has changed, and there is shadowing behind Pooh, caused by the light hitting him smack in the face. It looks like a flash has been used, and it's ruined the whole mood of the room - it doesn't look warm and cosy any more. This last photo was taken using my external flash, bounced off the ceiling in front of me (at an angle, so that it's not straight up) to diffuse the light. I could have also have bounced it off the ceiling behind me, or even to the sides, but the walls are painted a grey/green, and bear in mind that any colour you bounce your flash off will show up in your pictures. Bouncing it off something white or neutral is a better bet, so in this case, the ceiling. This looks much more like the photo taken without flash, so keeps the room mood, and hopefully you can't even tell that flash was used unless you are really looking for it. I've also managed to come down to ISO1250 (I could easily have gone lower if needed, but my camera handles noise well at this level) which from ISO12800, is down about three stops and again, although it is difficult to see when sized for web, the picture looks sharper and less noisy since I'm using a lower ISO number. And finally, some side by side comparison shots, but this time from a different angle. I bounced the flash to the side in this one (I was able to bounce it off the door on camera left, which helps give a stronger, more directional light (which gives more shadowing). Just another way you can use your flash to control the look of the light! All the photos where I bounced the flash came out looking much more natural than those with the flash pointed straight on which goes to show how much difference angling your flash can make. With an external flash you can also dial the power of your flash up or down - so if you are getting too much flash, you can turn the power down - not enough, and you can turn it up. This gives you enormous control over the light it produces. Working in low light is probably the most common reason for wanting to buy a flash (like in the photos above) but due to this control over the power, you can also use your flash as a fill light on a sunny day, or just adding a boost of light when you need to fill in some shadows. You can even use it as a off camera flash (by attaching it to a light stand with brolly) giving you a studio like set-up. If you are on the market for a flash, then look for one that allows you to swivel the head in all directions for the most control. It's one of the main plus points about having an external flash - the ability to bounce light so it's soft and directional - so I would say that's pretty essential. Also, if you want to buy an off brand i.e not Canon or Nikon, then be aware that the the ETTL might not work with an off camera brand. (ETTL / TLL is like Semi Automatic modes for flash, trust me, I think you'll want it!) Check before you buy. The last consideration is power - bouncing light around needs more power than if you were just firing it directly at your subject, so check the output levels. Of the Canon flashes that are available at the moment, I wouldn't recommend the Canon 270EX II as that doesn't allow a lot of options for bouncing your flash. The 600EX-RT is the top of the line model, and if you are looking to do weddings or similar, then this would be the best model to get (You would also need this model if you were looking to get into more complex off camera flash set-ups with masters and slaves which I know next to nothing about) My personal recommendation would be for the 430EX. I realise that was all Canon, Nikon have the same kind of line up, so my recommendation would be the SB-700. These middle models still give you a great amount of control but for a pretty decent price. One last bit of advice - if you want a flash for using over Christmas etc (I love it for Christmas Eve, and since it is still dark at the wholly unreasonable hour we have to get up on Christmas Morning, it's pretty darn useful for then too) I would suggest getting it a couple of months beforehand at the very least - there is a bit of a learning curve with using flash so it's better to get it ahead of time. If you do get yourself a speedlight, you can see my quick start guide to using an external flash here.